Since November 2006 Martin Schepers is painting and drawing in Los Angeles. Adhering to his impressions, he has created large format drawings made up of multiple sheets of paper which interpret the numerous centres of the city, their intertwining and their seemingly endless expanses through nets of circular patterns. "It is becoming more and more clear to me that the preoccupation with landscape painting is debating the question, to what extent art can be poetic. It holds no interest for me to depict impressions and experiences of a concrete landscape In the classical sense. It is more about finding out which possibilities exist today that allow art to be poetic." Former works, created in Germany, are dealing with the phenomenon of light and space, with openness and closeness. 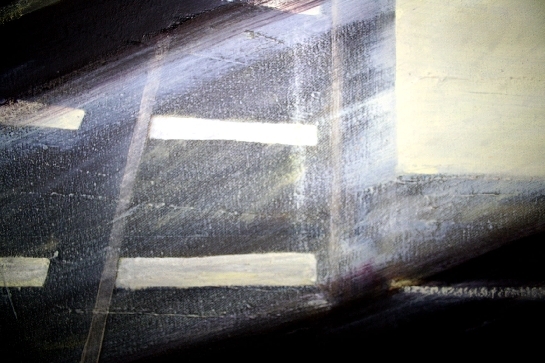 In the paintings, which carry such titles as "Hochsitz-offen" (raised high/open), the viewer has to decide, if the light is penetrating the inside of the shed or beaming out from it. Martin Schepers (*1979) lives and works in Duesseldorf (Germany). He studied at both the Kunstakademie Munster and the Kunstakademie Duesseldorf, where he graduated as a Meisterschüler of Prof. Siegfried Anzinger in summer 2006. Since November 2006 he is on a Cusanuswerk scholarship in Los Angeles ,USA. In his first solo show he is presenting at Galerie Werner Klein paintings and drawings from the past two years as well as new work from L.A.